Despite a widely held view that gold should be trading north of $1,400 this year, since the February peak well short of that target, prices have gone in the other direction. Gold mining stocks have fared slightly better after a flurry of mergers and acquisitions at the top end rekindled interest in the sector despite the lacklustre performance of the metal and all those burnt fingers from the M&A frenzy during the boom years. Stock Trends Report/Junior Gold Report Newsletter and website: Stock Trends Report Newsletter/Junior Gold Report Newsletter and website is published as a copyright publication of Stock Trends Report/Junior Gold Report (STR). No Guarantee as to Content: Although STR attempts to research thoroughly and present information based on sources we believe to be reliable, there are no guarantees as to the accuracy or completeness of the information contained herein (newsletter and website). Any statements expressed are subject to change without notice. It may contain errors and you should not make any investment decisions based on what you have read on here. STR, its associates, authors, and affiliates are not responsible for errors or omissions. By accessing the site and receiving this email, you accept and agree to be bound by and comply with the terms and conditions as set out herein. If you do not accept and agree to the terms you should not use the Stock Trends Report site or accept this email. Consideration for Services: STR, it’s editor, affiliates, associates, partners, family members, or contractors may have an interest or position in the featured companies, as well as sponsored companies which compensate STR as such our opinions are biased. We may hold options in and trade these stocks of the companies we profile and as such our opinions are biased. STR and its’ owner and affiliates/associates may buy/sell and trade the featured companies from time to time. STR has been paid by the companies. Thus, multiple conflicts of interest exist. Therefore, information provided here within should not be construed as a financial analysis but rather as an advertisement. Conduct your own due diligence: The author’s views and opinions regarding the companies featured in report(s) are his/her own views and are based on information that he/she has researched independently and has received, which the author assumes to be reliable. You should never base any buying/selling/trading decisions off of our emails, newsletter, website, videos or any of our published materials. STR aims to provide information and often stock ideas but are by no means recommendations. The ideas and companies featured are highly speculative and you could lose your entire investment – consult a licensed financial advisor if you are considering investing in any of the featured companies. Subscribers/readers are encouraged to conduct their own research and due diligence. The companies mentioned are high risk and considered penny stocks that contain a high risk of volatility, therefore consult your investment advisor and do your own due diligence before purchasing. Never base any investment decision on information contained from our emails, newsletter, website, videos or any of our published materials. No Offer to Sell Securities: STR is not a registered broker dealer, investment advisor, financial analyst, stock picker, investment banker or other investment professional. STR is intended for informational, educational and research purposes only. It is not to be considered as investment advice. No statement or expression of any opinions contained in this report constitutes an offer to buy or sell the shares of the companies mentioned herein. Links: STR may contain links to related websites for stock quotes, charts, etc. STR is not responsible for the content of or the privacy practices of these sites. Information contained herein was extracted from public filings, profiled company websites, and other publicly available sources deemed reliable. Information in this report was taken on or before writing and dissemination and may not be updated. Do you own due diligence as information and events can and do change. Published reports may reference company websites or link to company websites and we disclaim and responsibility for the content and accuracy of any such information or website. Release of Liability: By reading the newsletter/website and/or watching videos by STR, you agree to hold STR, its associates, sponsors, affiliates, and partners harmless and to completely release them from any and all liabilities due to any and all losses, damages, or injuries (financial or otherwise) that may be incurred. Except for statements of historical fact, certain information contained herein constitutes forward-looking statements. Forward looking statements are usually identified by the use of certain terminology, including “will”, “believes”, “may”, “expects”, “should”, “seeks”, “anticipates”, “has potential to”, or “intends’ or by discussions of strategy, forward looking numbers or intentions. Such forward-looking statements involve known and unknown risks, uncertainties and other factors which may cause the actual results or achievements to be materially different from any future results or achievements expressed or implied by such forward-looking statements. Forward-looking statements are statements that are not historical facts, and include but are not limited to, estimates and their underlying assumptions; statements regarding plans, objectives and expectations with respect to the effectiveness of the Company’s business model; future operations, products and services; the impact of regulatory initiatives on the Company’s operations; the size of and opportunities related to the market for the Company’s products; general industry and macroeconomic growth rates; expectations related to possible joint and/or strategic ventures and statements regarding future performance. Stock Trends Report does not take responsibility for the accuracy of forward looking statements and advises the reader to perform their own due diligence on forward looking numbers or statements. GOLD STANDARD: Could Bringing Back the Gold Standard Make America Great Again? “We have gold because we cannot trust governments,” President Herbert Hoover famously stated in 1933 to Franklin D. Roosevelt. (CBC News)  Anyone who seriously claims to trust the government is either a fool carrying an empty bag or a politician. This was the same year that Roosevelt enacted the Emergency Banking Act followed one month later by the Executive Order 6102. Suddenly everyone who had been buying up gold in a bid for some sort of financial security, in the midst of terrible economic conditions, literally had it wrested from their hands. You can imagine at that point, the rapid spiralling downward fall, like Alice in Wonderland tumbling down the rabbit hole, of trust in the government. There would have been some angry rabbits out there at having to hand in their carats. More recently, seemingly gold-loving President Trump has thrown around the idea. In a 2015 interview with GQ, he stated: “Bringing back the gold standard would be very hard to do, but boy would it be wonderful. We’d have a standard on which to base our money.” (Forbes 2017)  Sure. That’s a great if you have your own private gold stock, which apparently he does, not to mention his glittering gold-plated fixtures. So how much of that statement could be a self-motivated rubbing-hands-together sort of thing as he could possibly anticipate a rise in net worth? But hold on a minute. One of the issues with having gold backed currency is the simplest of all principles. It’s like the six-year old who goes to the store to buy candy but doesn’t have enough money to get what he wants. His plan fails. And next time, he will understand the simple concept that without enough money to back up your idea, it just won’t work. Even he will get that. So what if there isn’t enough gold to set up a proper gold standard? What if it is just a useless trip to the store or just a misguided fairy tale of an idea? In the Goose That Laid the Golden Egg, a poor cottager and his wife were delighted when they found that their goose daily laid a golden egg. Eventually, greed took over and it wasn’t enough for them. They slaughtered the innocent goose in a bid to extract as much gold as possible and as quickly as possible. Alas, when they sliced open the poor bird, rubbing their hands in glee at the thought of their marvelous gold-filled world, they were crushed to discover that inside it was just a normal goose. There were no large stores of gold hiding in its’ belly. The goose had been giving them everything it could. The cottager and his wife found themselves without gold and thrown back into financial difficulties. As they discovered too late the gold reserves they thought they could count on were just an illusion. They had brought on their own ruin by their abject mishandling of the situation. So the question is: is there enough gold in the world to adequately present the idea of gold-backed currency and avert negative consequences? The CIA World Factbook states that there is US $80+ trillion in broad money worldwide. Given that the collective value of gold in the world is less than 10% of that, the math doesn’t add up to allow for a viable gold standard. 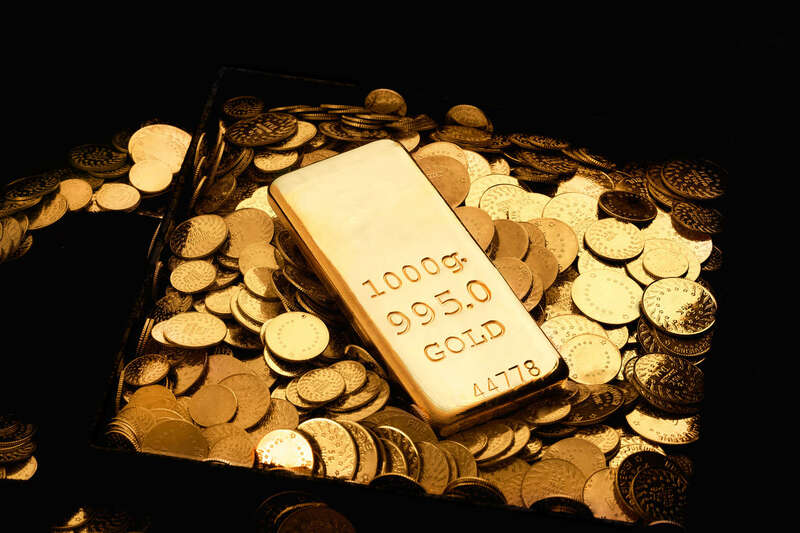 In the US, the approximate dollar value of gold that the country reportedly holds is $310.5 billion (United States Bullion Depository). It doesn’t even come close to $21+ trillion in debt. Given the discrepancy between the purported amount of gold the US holds and their very real astronomical debt, what could they do? How could they back their currency with gold when they don’t have enough collateral to balance it out? No bank would lend a wanna-be homeowner with a $50,000 salary and a demand for a $10 million mortgage with no down-payment, even a penny. That would just be inviting disaster. More likely, they would receive nothing more than a bright red “NO” stamp on their application. Keeping in mind the likely inability of the US to absorb a full gold standard, would a partial return to the gold standard work – one that puts certain controls or limits in place? Clearly, you would want to avoid the gold standard fiasco of the 1930’s. The US public is no doubt fed up with the ballooning federal deficit levels and colossal national debt that just seems to keep on going and going, like the Energizer bunny. Unfortunately, you can’t just take out the batteries to make the deficit stop. And it’s not likely that the politicians are going to stop their wanton spending. Power corrupts and corruption costs and so on and so on. The wheel continues spinning madly unable to stop. And here’s one thing that would have the Feds shouting objections. With a gold standard, their ability to print money would be restricted. They’re not going to like being told what they can and can’t do. There goes that power thing again. On the other hand, a gold standard would make it necessary to have gold in store to exchange for fiat money on an as required basis. In turn, the Feds could have no choice but to limit the amount of debt the government takes on, hopefully forcing it to concentrate on existing debt rather than irresponsibly taking on more. And maybe, just maybe, it would bring in some much-needed financial discipline and in turn that $21+ trillion could be chipped away at, although realistically that mammoth of a debt is not going to become extinct any time soon. However, even being able to pay a miniscule amount down combined with fiscal restraint could create a bit more economic confidence in the US. That, in turn, could generate future economic possibilities as other countries look with a kinder eye to cooperative efforts vs the China/Russia plan going on now with these two huge powers seemingly determined to dethrone the mighty USD as the leading global currency. They have been collectively hoarding gold amassing huge stores. In March 2018, China launched their gold-backed petroyuan with astounding success the first day of trading with a value of USD 4 billion transactions occurring. (RT 2018)  We just need to sit back with a giant bowl of buttered popcorn as we wait for their next moves. President Trump must be getting a little antsy with all this going on. He recently announced his nomination of Former Republican Presidential campaigner and pizza magnate Herman Cain for a seat on the Federal Reserve Board. Of course, everything that Trump does would seem to be carefully calculated to lend primarily support to himself and his ideas, and the nomination of Cain fits into this theory nicely. Cain is a known supporter of the idea of bringing back the gold standard. However, as it seems to be Trump’s fashion, Cain may not particularly care what the general masses think and be willing to find it ‘in someone else’s home’ to achieve a desired goal. For those who do want to see a return to the gold standard, they can take cheer in this recent announcement. Cain firmly believes that the US should never have gotten off the gold standard as by doing so it enabled Congress to inflate currency whenever it overspent creating the current mess. Point well taken. With some sort of a gold standard in place, it could safeguard against the same sort of tactics controlling inflation and keeping the economy in check. During a financial crisis, fiat money can seem to lose all appearances of relating to anything concrete. It may seem to make more sense to use it for kindling for the value it may give you and during tough economic times, people want something that gives the appearance of solidity as they desperately seek some form of stability to see them through the wild economic roller coaster ride. Within the gold market, we could see a rebound and return to the bulls as favor in the commodity increases and people may look to purchase gold in any form as they rush to what they see as solidity rather than placing their trust in other market industries. Gold has and possibly always will be the stable go-to as countries seek economic balance while wresting with controlling their debts and further spending. There are, of course, ways a gold standard could handcuff the Fed’s big-spending money printers. The Feds may not be able to raise or cut interest rates based on the country’s needs. Control over the US economy would, at least in part, be handed over to other countries whose vested interest might not be in the best interest of the US. And again, can you see the Feds sitting around their sumptuous board room table nodding in agreement to that? Given that he and Trump are likely on the same wavelength, pushing the idea through could really cause a wrath of fire and we don’t actually want a Third World War. Imagine President Trump, who has already stirred up such inane controversy about building a wall, which would not likely do anything except cost the country billions, being told by some other country leader that the US must do as they ask or face the consequences. With the US being as volatile as they are and ready to jump in whenever guns and soldiers are needed whether or not the US is actually involved in the issue at hand, who is going to be the first to push the super destructo button when their own honor is at stake? Not a pretty picture. Needless to say, the gold standard could come with certain hazards. While that may not happen, you can never say never, especially where power and control of money are concerned. And of course, unless huge stores of unmined gold are discovered and brought up in all their dust and glory, to supplement what is already mined, the current supply would have to be sufficient to support an increasing volume of transactions. Otherwise, this could run into a whole host of other problems including inflation, rising interest rates and potentially employment rate insecurity. And what is there really is a discrepancy between what the US says they have in gold reserves vs what actually is. What if a cover-up was discovered? That could have all the makings of a “GoldenGate”, with all the scandal and fluff attempts to divert attention from how things actually are and how they got there. Not something that any government needs. In the long run, a better solution might be to impose some form of caps on spending related to gold reserves – a modified gold standard. This at least, should allow the Feds to maintain control over the US economy without having to be at the discretion of other countries. It should also provide a reined-in spending platform, whereby the government might just consider fixing the current economic situation, rather than fervently creating new debt expecting that future generations will be able to cope with having their life-blood drained from them thanks to foolish politicians making foolish decisions. In any event, it is not likely that the US will return to a gold standard. Despite the greater stability that gold can provide over fiat money, it is probable that the Feds could direct the focus on the negative aspects of the gold standard in protest at having their hands tied, regardless of what might be better for the country. They also probably aren’t going to let their money supply or interest levels be determined by the world gold market. This is a great example of the philosophy Power is King, with a complete disregard of what might be best for the rest of the population. I recently spoke with Maximilian Sali, who along with Brad Telfer founded Barrian Mining Corp. Interesting to note is that Max comes from a long lineage of successful investors, his father was a founder and a director of Qtrade Securities, a large Canadian discount brokerage that had a major stake purchased by Desjardins and his uncle was a top producing broker in Vancouver who ran Dundee Securities until his retirement. Brad Telfer is the son of Ian Telfer, former CEO and currently Chairman of the Board of Goldcorp Inc., and one of the most prominent names in mining over the past three decades. In 2015, Ian was inducted into the Canadian Mining Hall of Fame and now Brad has taken a lead position in the industry. Generally, the apple doesn’t fall far from the tree. I will note that I’m not readily impressed by “names” because in its essence that’s all it is. It is more the character and integrity that is paramount. This is the first time I had an opportunity to work with Maximilian Sali and during time, will gauge his effectiveness of leading this company. Where the ‘names’ may come in is in opening doors or making doors available to open. I am a huge baseball fan. The Toronto Blue Jays have three young prospects with famous last names. The fathers of the prospects were past stars in baseball. The three prospects know what it is like to be around baseball and what it takes to be successful. This is a distinct advantage. The same grand slam advantages lie with both Maximilian Sali and Brad Telfer. And the mentorship is also priceless. In my opinion, what they are doing is strategic. I am always interested in hearing about new companies. They are ramping up at an impressive speed with what seems to be a well-planned out operations and promotional strategy. The overall vision that Max shared with me had me keyed up. I found myself wanting to hear more. In actual operations, Barrian is aggressively expanding their territories. In June 2018, Barrian entered into an agreement with Allegiant Gold Ltd., a subsidiary of Columbus Gold Corp. to acquire up to a 50.01% undivided interest in the Carlin type Bolo asset 90km northeast of Tonopah, Nevada with the possibility to earn into 75%. This is an exciting move for a number of reasons. Nevada has long been known as the leading state in the US for gold production. From 1965 to 2016, gold production in the state totaled almost 200M ounces. (Suzanne Featherston 2018). If Nevada were a country, it would likely be fourth in the world for gold production behind China, Australia and Russia. In addition, the Bolo site is located near Kinross’ Round Mountain mine which to date has yielded over 10M ounces of gold. Not a bad neighborhood to be in, keeping in mind that mining districts like real estate are about location, location, location. The results from the limited drilling in the Bolo area have shown excellent exploration targets. There are two north-south trending parallel faults. The Mine Fault has been traced for 2,750m with outcrop sampling values up to 8.6 g/t gold and the East Fault has been mapped for 2,200m with values up to 4.7g/t gold. Surface sampling has defined widespread gold mineralization, associated with jasperoids and iron-stained structures. Thinking of Barrian’s potential 75% stake, these results definitely made me sit up and take notice. I also really like that the Bolo project has easy accessibility to highways and amenities, a real bonus when you have to transport multi-ton equipment. Max made it clear that Barrian is fully committed to chartering this territory and based on already proven results feels that the project has all the factors to potentially be very profitable. Think of it as an explorer setting out to discover new lands, not quite knowing what he would find, but knowing he may find something and having the guts to go out and look for it. Ultimately, he possibly lands upon something bigger than what he expected. With time, these lands may become super-nations and his name is forever linked with great discoveries. In Barrian’s case, I personally am looking forward to what these discoveries may yield. Time will tell. A second site of Barrian’s operations, the Sleeper Asset, is in New Mexico, another state with a rich gold mining history that still has plenty to discover. The site has a major silver-gold bearing vein which means that not all eggs are in one metal basket and I do like that thought. Just to throw some numbers out there, in 2010 drilling outlined 845,000 tons (767,000 tonnes) averaging 9.35 opt (320 g/t) silver and 0.15 opt (5.1 g/t) gold. I also appreciate that this site contains dozens of mineralized and potentially mineralized veins that have yet to be tested. It always peaks my interest when I see a company in front of diverse possibilities. Last but certainly not least on my list of checkmarks is that Max understands the importance of marketing. He gets that you have to get it out there. Put it this way, if you write a book, what do you think would happen if your marketing plan consists of just telling a few friends about it and hope that it catches on. If your answer is probably nothing, no matter how good the book is, you are in all likelihood correct. A lot of good companies don’t get the exposure they need to bring their offerings to the public eye because by not seeing the importance of publicity, they simply fail to get on the marketing wagon. They may prefer instead to rely on a form of passive marketing to work miracles (like telling Uncle Ed and expecting that if he spreads the word at family dinners, the customers will come flocking to your door in droves). It doesn’t take a fortune teller to figure out how well that would likely work. To optimize publicity, Barrian has hit the ground running by hiring Peak Investor Marketing, a company with proven results to oversee their promotional campaigns. I had a conversation with Rita Bennett, VP of Marketing who outlined a marketing plan that left me initially confident that Barrian was well on the road to becoming a name on the lips of savvy investors. Note that about 22 million shares issued at five cents may be sold sometime into the market. From what I understand, there is an escrow period to these ‘cheap shares’. The company also recently did a financing at $.20 with no warrant. I expect there to be more dilution or some type of financing/loan to earn 50.01% for Bolo. The commitments for Barrian to earn into Bolo looks like this: In 2019, $500k in exploration and $250k shares. In 2020, $750k in exploration and $250k shares. In 2021 $1.25 million in exploration and $250k shares and in 2022 $1.5 million in exploration and $250k in shares. All this money spent on exploration could continue to produce promising drill results. In conclusion, with a strong and impressive management and geological team, interesting prospective projects, financing in place and an aggressive marketing plan, Barrian is one company that I think could prove popular with investors. I am looking forward to hopefully traveling to their Nevada site to see for myself the outstanding quality of production as I have done with other projects in other parts of the world. The stock should be trading sometime in mid-late April under the expected ticker symbol BARI on the TSX:V.
In my PDAC 2019 presentation, I spoke about how I think we may be headed for a period of economic downturn in 2020/2021 and how in these times gold tends to shine as an investment of choice. From what I have seen of Barrian, apart from their obvious strengths, they are a company with a timing that will be able to take advantage of this period solidifying themselves as a junior gold company of notable worth. Barrian Mining is an advertiser and as always, do you own due diligence. Except for statements of historical fact, certain information contained herein constitutes forward-looking statements. Forward looking statements are usually identified by the use of certain terminology, including “will”, “believes”, “may”, “expects”, “should”, “seeks”, “anticipates”, “has potential to”, or “intends’ or by discussions of strategy, forward looking numbers or intentions. Such forward-looking statements involve known and unknown risks, uncertainties and other factors which may cause the actual results or achievements to be materially different from any future results or achievements expressed or implied by such forward-looking statements. Forward-looking statements are statements that are not historical facts, and include but are not limited to, estimates and their underlying assumptions; statements regarding plans, objectives and expectations with respect to the effectiveness of the Company’s business model; future operations, products and services; the impact of regulatory initiatives on the Company’s operations; the size of and opportunities related to the market for the Company’s products; general industry and macroeconomic growth rates; expectations related to possible joint and/or strategic ventures and statements regarding future performance. Stock Trends Report does not take responsibility for the accuracy of forward-looking statements and advises the reader to perform their own due diligence on forward looking numbers or statements. It’s no secret that to be a successful investor or speculator, you have to govern yourself according to a set of rules. And I can’t find any better core rule than the famous Buffett quote above. It’s one that is the cornerstone of my investing career. Lava lies inside dormant yet festering under a seemingly unmoving platform until often without warning, when optimal conditions present themselves, it spews up with a mighty force making its’ presence known. The lava creates a random path. When the lava has finished its’ run, it returns to the dormant stage and the mouth retreats having done its’ damage. It’s a cyclical thing – just like the gold market that see-saws from bull to bear to bull dependent on factors that drive the force. And on the other end of that see-saw are stocks. It’s no secret that historically when stock markets have increased, usually gold has decreased and visa versa. Following tradition, gold has been in a bear market. However, if current economic predictions come to fruition in the next couple of years, the weight of the see-saw could shift and we could see an end to the bear’s hibernation season as it comes roaring out of its’ cave, ready once again to take on the world. It’s no secret that governments use many means to ‘manipulate’ the economy. In theory, they are supposed to do it for the good of the general public. Unfortunately, theory is seemingly not always put into practice. With the US $700+ billion bank bailout of 2008, it was supposedly done for the overall good of the economy. Ironically, millions of people who had lost their homes and savings in the crash, now had their tax money used to bailout the very people who had apparently caused or contributed greatly their ruin. With the economy in such a horrible state and again following a traditional path, gold started to rise taking the heavier weight of the see-saw as prices gained 25% from 2008 ($869.75) to 2009 ($1,087.50) OnlyGold.com. You can only imagine people desperately looking for some form of stability as the economy systematically spewed out one dangerous burning lava spill after another and politicians and bankers shut themselves up in their wood-grained offices nodding their heads in unison while looking after their own interests first. Gold, a rock-solid glittering asset that is understood amidst all the turmoil, should seem like a logical place to turn. Hence, the significant increase in price between 2009 and 2010. Over the next few years, gold decreased as the economy slowly emerged from the recession. As economic conditions improved, gold followed the pattern of hibernating back into a bear market. The current bull market in stocks has had a long run. I believe that the end of the marathon is coming, like the last runner panting to the finish line, striving to make it just a little bit further in shoes now worn down, having seen better days. The massive world debt points strongly to a weaker economy coming into play. If/when that happens, gold should once again rise from its’ submerged depths at the bottom of the market volcano providing some kind of security against being burned by the smoldering market. Unlike 2008 when we experienced a big spike down in the economy/real estate market and stock market, I believe the next downturn will consist of smaller bubble bursts from geopolitical to many down days in the global stock market to real estate value downturns. When the carnage is over, the price of gold should benefit. Looking back at 2008, it only took less than two years for the price of gold to reach new highs of over US$1900/ounce. The up and coming crisis I believe will mimic that of a 1937 downturn that was seen as a recession within the depression. The big downturn happened in 1929. Fast forward to modern day, 1929 can be compared to 2008, and the possible upcoming crisis may be seen like the 1937-1938 downturn. Not as sharp as the 1929 downturn but still significant. Heading into 2020, we could see choppy times but what has me concerned is possible events in 2021. Timing is the HARDEST to predict and note, these are just my so-called predictions. Always perform your own due diligence. And like Mount Vesuvius, once the lava has spewed out burning those who are ill-prepared to deal with the crisis, investors may be well-advised to put safety precautions in check as the economy slowly festers and a molten lava economy is spewed out that runs downhill without control burning stocks and other investments in its’ wake. In this case, you might want to consider ways to turn that molten lava into gold. Junior Gold Report and TechMoney360 Newsletter: Junior Gold Report’s and Tech Money 360’s Newsletter is published as a copyright publication of Junior Gold Report (JGR) and TechMoney360 (TM360). No Guarantee as to Content: Although JGR/TM360 attempts to research thoroughly and present information based on sources we believe to be reliable, there are no guarantees as to the accuracy or completeness of the information contained herein. Any statements expressed are subject to change without notice. It may contain errors and you should not make any investment decisions based on what you have read on here. JGR/TM360, its associates, authors, and affiliates are not responsible for errors or omissions. By accessing the site and receiving this email, you accept and agree to be bound by and comply with the terms and conditions as set out herein. If you do not accept and agree to the terms you should not use the Junior Gold Report and TechMoney360 sites or accept this email. Consideration for Services: JGR/TM360, it’s editor, affiliates, associates, partners, family members, or contractors may have an interest or position in the featured companies, as well as sponsored companies which compensate JGR/TM360 as such our opinions are biased. We may hold potions in and trade these stocks of the companies we profile and as such our opinions are biased. JGR/TM360 and its’ owner and affiliates/associates may buy/sell and trade the featured companies from time to time. JGR/TM360 has been paid by the companies. Thus, multiple conflicts of interest exist. Therefore, information provided here within should not be construed as a financial analysis but rather as an advertisement. Conduct your own due diligence: The author’s views and opinions regarding the companies featured in report(s) are his/her own views and are based on information that he/she has researched independently and has received, which the author assumes to be reliable. You should never base any buying/selling/trading decisions off of our emails, newsletter, website, videos or any of our published materials. JGR/TM360 aims to provide information and often stock ideas but are by no means recommendations. The ideas and companies featured are highly speculative and you could lose your entire investment – consult a licensed financial advisor if you are considering investing in any of the featured companies. Subscribers/readers are encouraged to conduct their own research and due diligence. The companies mentioned are high risk and considered penny stocks that contain a high risk of volatility, therefore consult your investment advisor and do your own due diligence before purchasing. Never base any investment decision on information contained from our emails, newsletter, website, videos or any of our published materials. No Offer to Sell Securities: JGR/TM360 is not a registered broker dealer, investment advisor, financial analyst, stock picker, investment banker or other investment professional. JGR/TM360 is intended for informational, educational and research purposes only. It is not to be considered as investment advice. No statement or expression of any opinions contained in this report constitutes an offer to buy or sell the shares of the companies mentioned herein. Links: JGR/TM360 may contain links to related websites for stock quotes, charts, etc. JGR/TM360 is not responsible for the content of or the privacy practices of these sites. Information contained herein was extracted from public filings, profiled company websites, and other publicly available sources deemed reliable. Information in this report was taken on or before writing and dissemination and may not be updated. Do you own due diligence as information and events can and do change. Published reports may reference company websites or link to company websites and we disclaim and responsibility for the content and accuracy of any such information or website. Release of Liability: By reading and/or watching videos by JGR/TM360, you agree to hold JGR/TM360, its associates, sponsors, affiliates, and partners harmless and to completely release them from any and all liabilities due to any and all losses, damages, or injuries (financial or otherwise) that may be incurred. Except for statements of historical fact, certain information contained herein constitutes forward-looking statements. Forward looking statements are usually identified by the use of certain terminology, including “will”, “believes”, “may”, “expects”, “should”, “seeks”, “anticipates”, “has potential to”, or “intends’ or by discussions of strategy, forward looking numbers or intentions. Such forward-looking statements involve known and unknown risks, uncertainties and other factors which may cause the actual results or achievements to be materially different from any future results or achievements expressed or implied by such forward-looking statements. Forward-looking statements are statements that are not historical facts, and include but are not limited to, estimates and their underlying assumptions; statements regarding plans, objectives and expectations with respect to the effectiveness of the Company’s business model; future operations, products and services; the impact of regulatory initiatives on the Company’s operations; the size of and opportunities related to the market for the Company’s products; general industry and macroeconomic growth rates; expectations related to possible joint and/or strategic ventures and statements regarding future performance. Junior Gold Report/TechMoney360 does not take responsibility for the accuracy of forward looking statements and advises the reader to perform their own due diligence on forward looking numbers or statements. By the early summer of 1940, Belgium and the Netherlands were defeated. …a mere twenty one miles from England’s doorstep. 1 of 5 Canadian Maple Leaf one ounce Silver Coins!